Cook’s published this Jojo Spice Blend for their wonderful Jojos. If you’re not familiar, they’re wonderful, battered, deep-fried potato wedges – and unfortunately, they aren’t on this blog. But the Jojo Spice blend is! I’ve found it’s just as good on my oven-fries, Bomb Baked Potato Wedges and my Crispy Oven Roasted Chick Peas. I’ve also sprinkled it on chicken breasts, my Stupid Simple Sweet Potato Fries and whatever else strikes my fancy. This mixture has a good bit of a kick to it! Mix together. Store in tightly closed jar. Makes enough for two recipes of Jojos. This entry was posted in Click here for Fabulous Food Posts and tagged Cook's Illustrated, Frugal Hausfrau, potato wedges, Potatoes, Spice & Herb Blends. Bookmark the permalink. 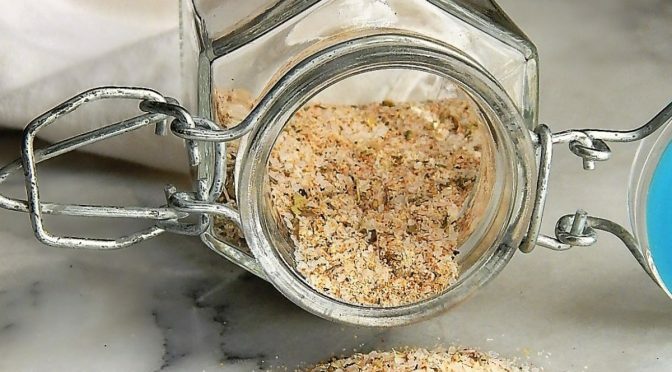 A terrific spice blend to give added taste to so many things. It is, too. Those 5:00 days, and I’m not sure what I’m making? Sprinkle a little of this on just about anything! It’s good on eggs or hashbrowns for breakfast, too. Sweet Potatoes would be fantastic with this! I sometimes mix some of this in with yogurt for a dipping sauce. Sour Cream or a Sour Cream/Mayo combo would work, too! Also just wondering if you got my email? Need to confirm if you can do the date for the guest post? 😀 Thanks again! Easy and something pretty much everyone has on hand! Very good spice mix…that’s going on the next home made chips..
Smart man! But I already knew that from your gorgeous (and witty) blog! The spice mixture looks terrific. I bet it’d taste excellent on sweet corn. The seasoned fries might be nice with a bowl of chili and a can of beer. You know, I think you’re right – especially if it were made with that cheesy Mexican mayo mixture. I think almost anything goes well with Chili and Beer.I would lay out the potatoes and cover them with Chili and Cheese. Canadian Poutine would have nothing on a mixture like that.And then, I would regret it the next day! A little of this spice mix might go very well IN chili. Why don’t we have Cajun Chili?? I think you should make some up! This sounds like my friend’s mum’s sweet potato coating, except she puts nutmeg in hers too. Anyway, glad to have this in my notes now… after she told me the recipe, I promptly forgot everything that was in it except for the nutmeg… but I know she’s a huge fan of Cook’s. Myriam, I wonder if there was some brown sugar in it, too? I think I remember seeing a mixture kind of like that in Cook’s, not quite as spicy as this, though. I’m a huge fan of Cook’s, too, except they do too many of the same old recipes and sometimes they seem to be just very good recipes without the special touches we home cooks come up with. They didn’t do that, here, and really came through with the heat! This looks like a delicious flavor blend – perfect for potatoes! Thanks, Amy! Of course the only credit I deserve is being smart enough to try it 🙂 We love it! Thanks, Amy. I really like making my own little mixes like this because they’re so easy to change up = heat lovers can add more hot stuff, those with kids can cut back, etc. Hi Dale! Hope you love it, too! I think it’s becoming my “signature” spice. I can foresee it become “mine” too! I think I saw a little French Cajun coming out in your previous comment! Thanks, Chitra, and it is!